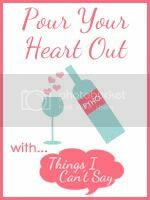 I was thinking about writing a post for Pour Your Heart Out since last week… Friday to be exact and some how it snuck up on me and I’m a bit behind the game since the linky went live Wednesday morning. If I’m lucky I’ll be like the 100th person to link up. I may ramble a bit through this so I apologize in advance if I do. So I have a blog (duh…) and I write and write…. And sometimes I ignore my blog for a couple of days here and there because life has a tendency to step in and take hold of my time. Often I try to make an effort to write a really good post and other times I get busy and try to get something out quickly that isn’t of the highest quality. But when I write something that I think is pretty good I tend to hope for comments & constructive criticism and nothing happens. Nothing. Meaning that half the day goes by before there is one comment. It’s disheartening. It makes me wonder if I did something wrong, if I wrote something that offended people, or if what I wrote wasn’t comment worthy. And honestly, I don’t know what it is. There are times that I just let it go and not worry about it because really I need to write for me and not for comments or anyone else. Right? Then there are other times where it does bother me. The most important thing I need to remember is that comments aren’t everything, numbers aren’t that important, comments aren’t that important, and I need to remember what is. My writing. The words that I write are what are important. I like what I do and I like writing. And I’m going to keep on doing it with or without comments. I just need to come to an understanding that not everything is comment worthy even though people read it.